Evergreen Currant, foliage scent like wine/pine/apple, variable. 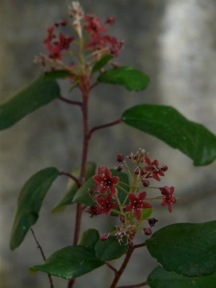 Young stems red, turn woody rouge brown, maroon-red flowers in panicle clusters in Winter-Spring followed by tiny red fruit. Prefers shade or light dappled sun, though can take some moderate sun. Easy to keep within a couple feet in height, though can get a few feet tall or more, and can spread much more. Mixes well with Venegasia, Keckiella, and some other Ribes species due to the their preferences for protected somewhat shady locations. Ideal below oak trees. Bottom photo from Las Pilitas Nursery.